Brightline’s announcement Friday that it would rebrand as Virgin Trains USA was followed Monday by an SEC registration for an initial public stock offering. Blanks for the price and size of the offering weren’t filled in on the SEC S1 registration, but shares will trade on NASDAQ under the symbol VTUS. The book runners for the offering are blue chip Wall Street firms Barclays, JP Morgan and Morgan Stanley. The seller of the stock is AAF Holdings, which is the acronym for All Aboard Florida, the initial name for the Brightline service. AAF is controlled by Fortress Funds, one of the nation’s largest private equity companies. The net proceeds from the offering, a concurrent private placement, and/or future debt or equity financings will be used to rebrand Brightline to Virgin Trains USA, to continue upgrading the infrastructure along Brightline’s tracks and complete construction of the route to Orlando and start the route to Tampa, which Brightline won recently after an uncontested RFP with the state. Money would also be available to help purchase the Xpress West high-speed rail project from Las Vegas to California and for general corporate purposes. On Friday, Brightline, America’s first new major private intercity passenger railroad in over a century, announced a new strategic partnership and trademark licensing agreement with the Virgin Group, one of the world’s most recognizable brands in travel and hospitality. The partnership will allow Brightline to leverage Virgin’s industry-leading expertise and customer experience to establish a powerful new brand, “Virgin Trains USA”. Virgin Group has more than 60 companies focused on its core consumer sectors of travel and leisure, telecoms and media, music and entertainment, financial services and health and wellness. Virgin is already active in South Florida with Virgin Cruises based in Plantation and Virgin Atlantic airline service to Miami. 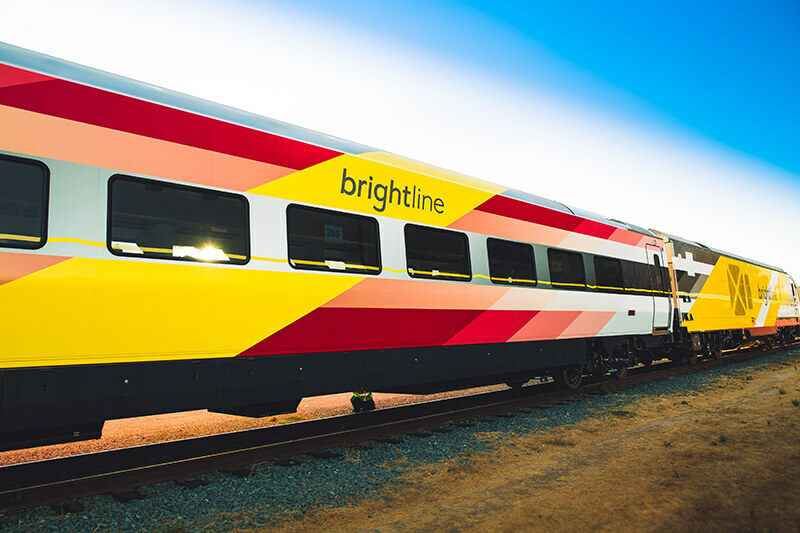 As part of the strategic partnership, an affiliate of Virgin Group has agreed, subject to certain closing conditions, to make a minority investment in Brightline. Funds managed by an affiliate of Fortress Investment Group LLC will retain majority ownership of Brightline. Brightline’s current management team will oversee daily operations, engineering, business development and strategy. Brightline will rename itself Virgin Trains USA this month and transition to Virgin Trains USA branding in 2019.